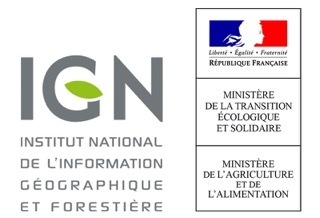 The French NGI has created online programs giving anybody pieces of information about the French forest, by building specific queries. This module « standard tables » allows you to get easily the most useful result tables and graphics. You can find information about the surface area, the living wood stock volume, the annual forest increment, the forest harvesting and mortality. Some of these results can be distributed by species, conditions of exploitability, class of property or several ecological factors. The results can also be distributed according to different territorial subdivisions (administrative or ecological). For example, this allows the user to get the full results for the French 13 administrative regions. The new method, done every year and at a national scale, is available since 2004. It produces results from the addition of 5 inventory campaigns (i.e. 2013-2017). The former method was made on department inventories (until 2004) and gives only results on departments.